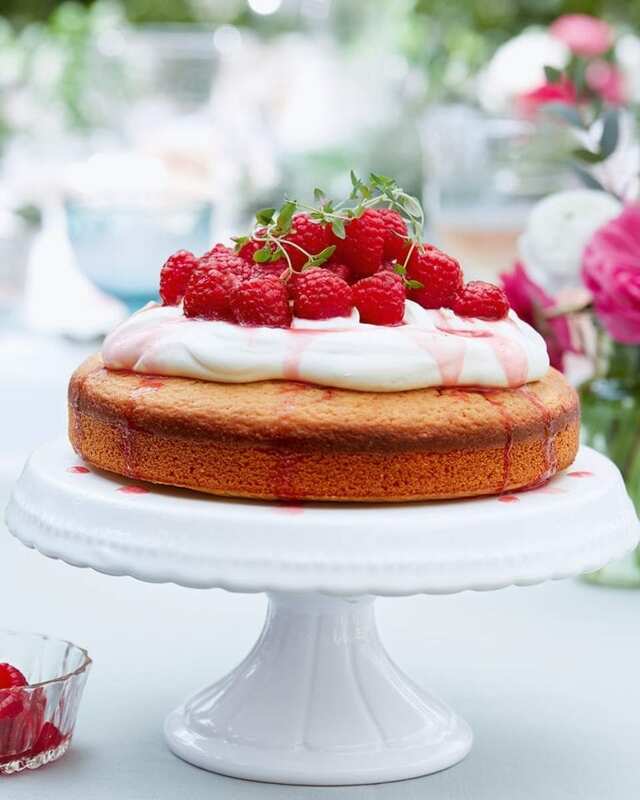 A stunning, summery bake that sees a zesty orange and almond sponge slathered in a honey and orange blossom cream, then drizzled in rosé red berry syrup. Heat the oven to 180°C/160°C fan/gas 4. Put the olive oil, sugar, eggs, orange zest and juice, orange blossom water, yogurt, self-raising flour and ground almonds in a large bowl and whisk until just combined. Pour into the prepared tin and bake for 35 minutes or until a skewer pushed into the centre comes out clean. Cool on a wire rack in the tin for 5-10 minutes, then turn out and leave to cool completely. Meanwhile make the rosé red berries. Put the sugar, thyme and rosé wine in a medium pan and heat until the sugar has dissolved. Bring to the boil, then reduce to a simmer for 5 minutes until thickened to a syrup. Remove from the heat and leave to cool for 10 minutes. Add the berries, stir gently and set aside. In a bowl, whisk the cream, crème fraîche, honey and as much orange blossom water as you think it needs until it forms soft peaks. Put the cake on a plate or cake stand and spoon the cream on top. Add the berries, drizzle with the syrup and scatter with extra thyme leaves. Make the cake and poach the berries up to 24 hours in advance. Wrap the cake in cling film and the keep berries in an airtight container in the fridge. Bring to room temperature to serve.